3piece man's suit, navy blue with pale blue and grey pin stripe,wool woosted material fully lined with silk tafeta. Edwin Parr Hood cam to heathcote in 1891. at the age of twenty he had already leaned the tailors trade.He set up his business in High Street opposide the Mt. Ida Hotel. he advertised his stocks of mens clothing in the McIvor Times. 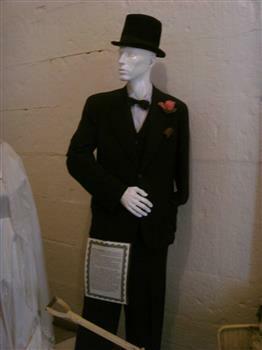 2 suits made by E. P. Hood donated to the Museum by a local family whose father had purchased the suits in Heathcote. 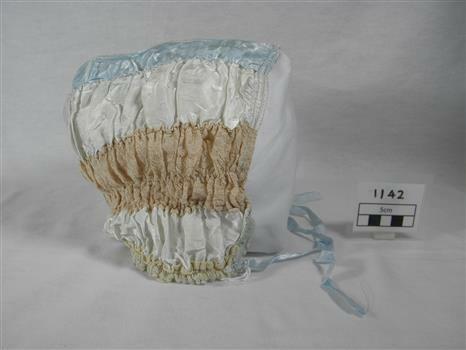 Worn on several occasions in and around the district of Heathcote. 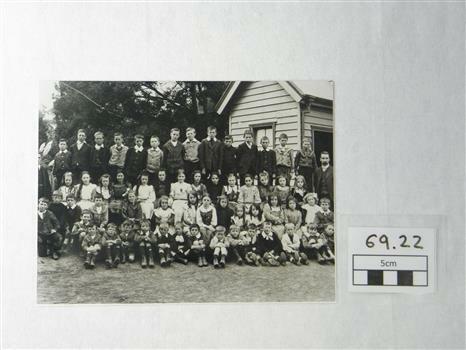 Believed to be long to Routledge Brothers who ran a general store business in heathcote. They also owned a sawmill and quartz crushing battery. 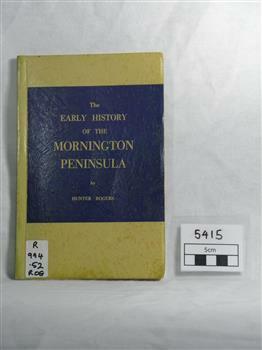 one of three books donated to the Museum, were found by the donors father back in the late 1960's while he was working on renovations to a building in heathcote these books had been thrown onto a pile of builders rubble, he retrieved them. 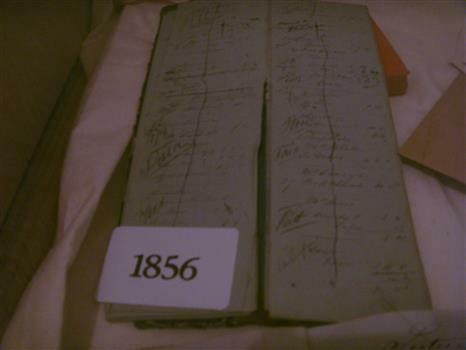 when he passed away some years later his son found them while clearing out his effects, have travel through several house changes till 2010 when the son was doing a cleanup and the books were found again he contacted the Historic Society, date back to first settlement of Heathcote, inside writing is in excellient condition, as if it were written yeaterday. give a daily account of purchases by locals.gives us an insight into persons living and working in Heathcote McIvor district. Not many early items of this era left . F4E at start up RAAF Darwin tarmac.Armed with Sidewinder and Sparrow missiles. Photograph taken from the aircraft nose showing raised cockpit canopies,groundcrew and aircrew readying the airrcraft for flight. Note air start is connected Aircraft Serial No. A69-217. 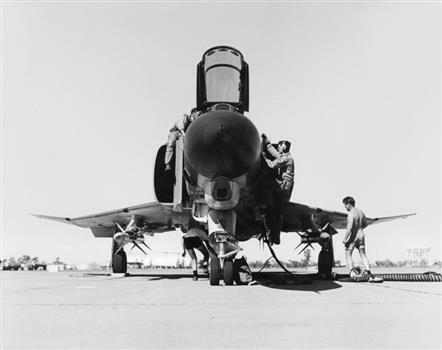 The F4E depicted was tasked to 'cold soak" Sidewinder and Sparrow missiles in the troposphere at 53,000 feetabove Darwin in a joint exercise for the RAAF and the United States Navy in 1972.The aircraft is being readied for flight by the aircrew and ground crew at RAAF Darwin. WW2 RAAF Wolsley cork helmet. Helmet Khaki cotton six (6) panel outer, with three (3) fold pugaree. Colour patch on left side approximately 6cm X 5.5cm, Dark blue,2.5cm, Light blue, 0.5cm and Maroon 2.5cm. Tan leather trim around brim, tan leather chin strap. Traditional pith helmet four (4) hole domed type vent on top of crown. Beige leather sweat band pierced around the top and with a cotton cord adjustment threaded around. Fixed to shell in four points diagonally. Interior is also covered in Khaki cotton. 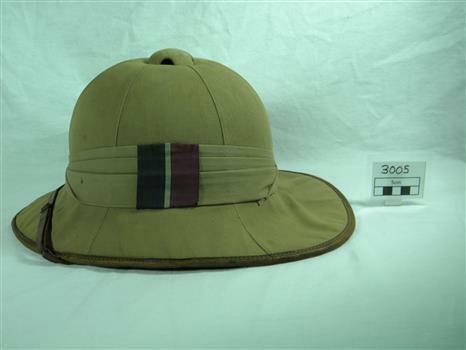 This type of head dress was very commonly worn by British Commonwealth Forces in the Sub Continent and other tropical areas. 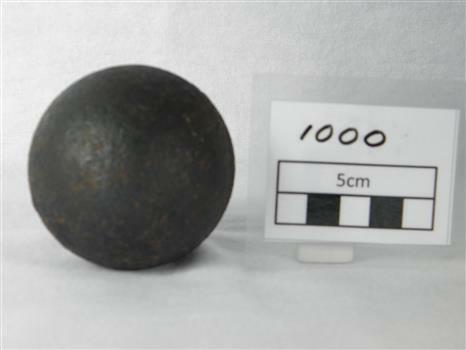 This particular example would have been a common sight in Northern Australia during the time frame, as well as Africa, Middle East and the Pacific. It is a light weight ventilated helmet offering good air circulation via the vent in the top of the crown, and shade to the back of the neck. As well as protection by the peaked front for the eyes reducing glare, preventing sun and heat stroke. It also created an image of gentlemanly dress and pride in appearance. It conformed to an ideal and was considered quite fashionable and a little dashing, often worn at a jaunty angle, creating a rakish air, far from today's simplistic view of pure functionality and at as low as possible cost. Whether worn with a tropical uniform with jacket and trousers, or open necked shirt and shorts, the wearer was easily identifiable as British or one of the Commonwealth countries. One of the most important and successful attacks on merchant ships inside an enemy harbour during world war two by English and Australian Commandoes or Special Unit Forces, launched from Australia. 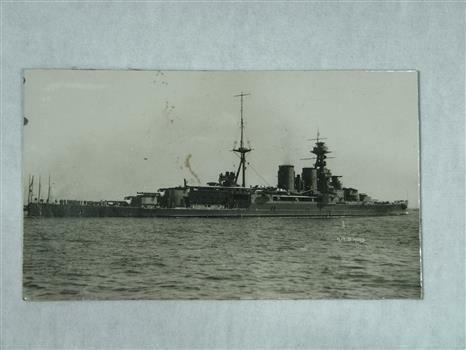 Nil deaths by the Commandoes were recorded, and 40000 tons of enemy ships were damaged or destroyed. 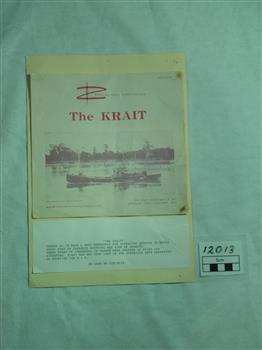 To enlighten RSL Members and the public, the history of the MV Krait and the importance of our Military History. White cardboard decoratively embossed mountboard surround and cardboard backing. 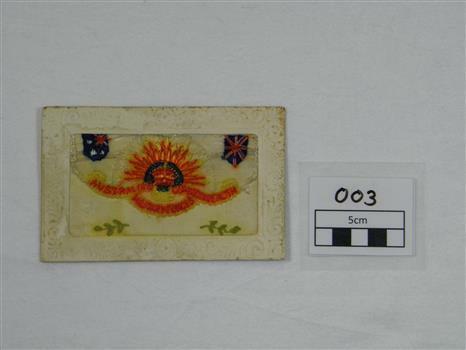 Centre contains an embroidered muslin with the Australian Commonwealth Military Forces Rising Sun Emblem surrounded by the Australian and British flags with leaf decoration. Commonplace postcard sent by Frank O Brien World War One veteran and former patient of the repat, to his father from France during World Ward One. 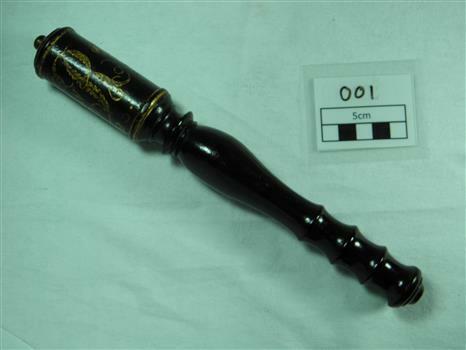 Painted black wooden baton, with gold leaf inscription. Baton has been shaped to provide a hand grip with three wooden grooves, barrel/cylinder shape at the other end. The tipstaff is a symbol of office for the court officical responsible for keeping order in the court, also called the tipstaff. This tipstaff dates from 1826 and is marked with the reign of George IV. This tipstaff was unlikely to have been used in the Supreme Court of Victoria, and is probably an item donated to the court in the 20th century. This is the only item of this nature held by the court, the item because of its age would be quite rare. This rarity makes it of state significance, further research needs to be undertaken with regard to national and international (ie. UK) significance. 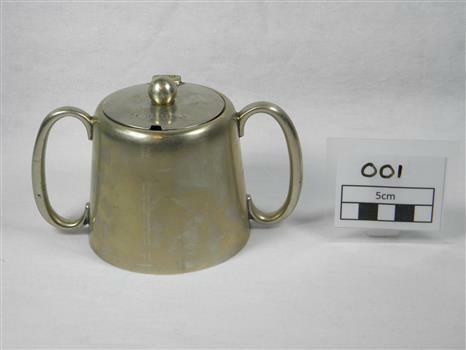 Painted "Gold Crown/1826/ GR IV/ R. 11"
Stainless steel sugar bowl with single hinge lid with single knob and two oval like handles, on opposite sides, Bell like in shape. Cutout in lid for spoon location is representative of a rectangular shape. Used in the hospital setting as general kitchen ware. For patients and staff in dining rooms. Stainless steel selected due to robust nature. Reflects an earlier era before individual serves, bulk sugar being the only availability. Significant as it is reflective of an earlier era and a somewhat expensive and decorative piece that is no longer in use in society. Embossed on lid "R.G.H.H". 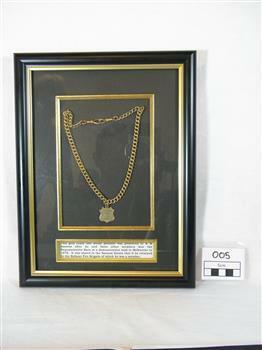 Embossed on bottom "EXHIBIT/ E.R.N.S.AS"
this gold chain and medal pendant was presented to W M sansom after he and three other members won the representative race at the demonstration held in Melbourne in 1878. it was stated in the Sansom estate that it be returned to the Ballarat Fire Brigade of which he was a member. 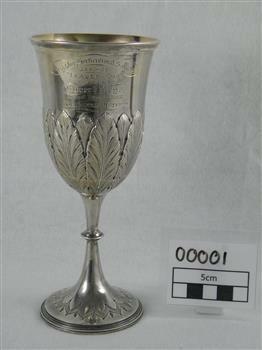 (engraved on front of medal) "PRESENTED / To / G. Sansom"
This item is significant because of its connection with the Keys Family who were early settlers in District of Brighton/ Moorabbin and were greatly involved in community activities. After the 1841 Dendy Special Survey allotments of land were sold or rented to pioneer settlers who developed market gardens, fruit farms ( orchards), vineyards, poultry farms in the area now known as Bentleigh, Cheltenham, Oakleigh. They were very proud of their fine produce and hence enthusiastically entered these 'Annual Exhibitions' by the Brighton Horticultural Society. Princess Mary 1914 Christmas Gift. Decorative brass gift box with Princess Mary's profile surrounded by a laurel wreath engraved in the the centre of the lid, with the letter M on both sides. The names of the allied nations are engraved in the corners and on the sides. A sword and scabbard decorate the top side. The lower side is decorated with battleships.. In November 1914, an advertisement was placed in the British national press inviting monetary contributions to a 'Sailors and Soldiers Christmas Fund' which had been created by Princess Mary, the 17 year old daughter of King George V and Queen Mary. 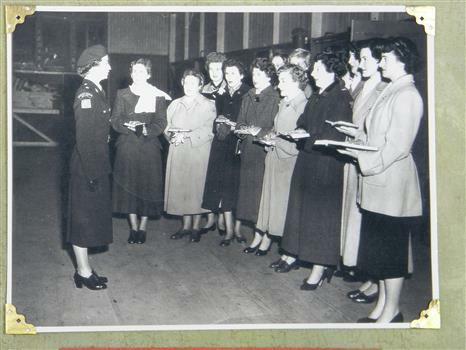 The purpose was to provide everyone wearing the King's uniform and serving overseas on Christmas Day with a 'gift from the nation'. The response was overwhelming, and it was decided to spend the money on an embossed brass box, based on a design by Messrs Adshead and Ramsay. 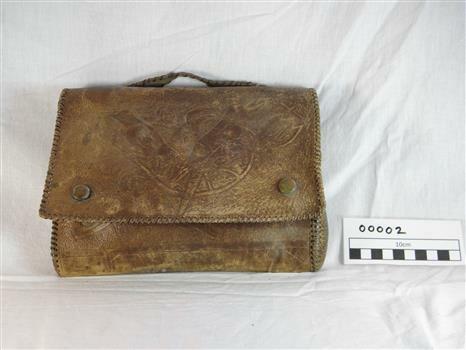 The contents varied considerably; officers and men on active service afloat or at the front received a box containing a combinationof pipe, lighter, tobacco and 20 cigarettes and wrappers. Non smokers received a bullet pencil and a packet of sweets instead. 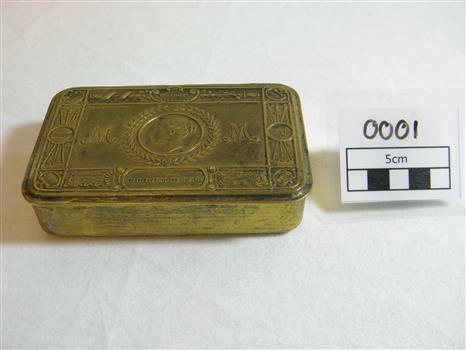 Indian troops often got sweets and spices, and nurses were given chocolate.This box is on loan from the grandson of the soldier who it was given to. This box is on loan from Terry Phillips. It belonged to his Grandfather who served at Gallipoli. At the top a decorative cartouche contains the words "Imperium Britannicum" and one on the lower edge contains the words "Christmas 1914". In small roundels on the corners appear the names "Belgium", "Japan", Montenegro" and "Servia". "France and "Russia" are written on the short sides. Blue cardboard folder of 4 pages containing 1 photo and inscription. Photo is of Queen Elizabeth sitting down and Prince Phillip standing to the left of her in front of a fireplace. 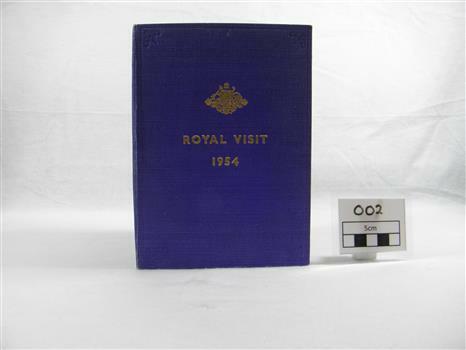 Handed out to patients and visitors to commemorate the visit of her Royal Highness Queen Elizabeth II And Prince Phillip to Victoria in 1954 and in particular the Heidelberg Repatriation Hospital. This brought much excitement to the patients at Heidelberg. Printed paper, colour black white. top of pamphlet depicts a stylised platypus and boomerang with text below. Leaflet dropped from German/Italian aircraft on to Australian troops defending El Alamein during 1942. These propagander leaflets were designed to lower moral of defending troops, but were generally unsuccessful. 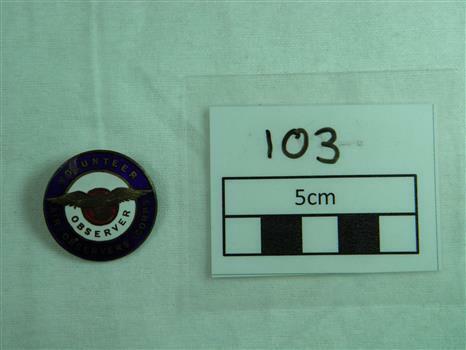 This item relates to the history of the defence of El Alamein by Australian Forces in the Middle East 1942, and the bombing of Darwin by the Japanese in 1942. Printed on pamphlet "Diggers! 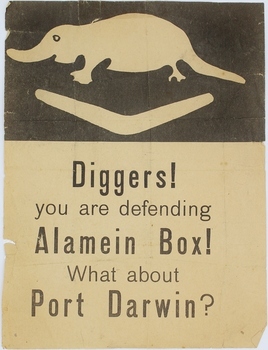 / you are defending / Alamein Box! / What about / Port Darwin?" 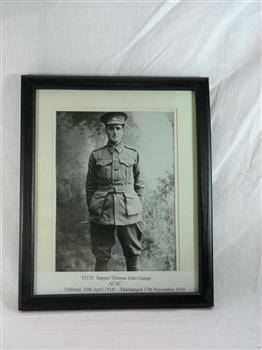 Reprint of original black and white studio portrait of man in Australian World War One Army uniform standing with swagger stick set against landscape background, photograph mounted in modern wood frame.Typed information on paper strip at bottom of frame, this information is written on back of photograph. 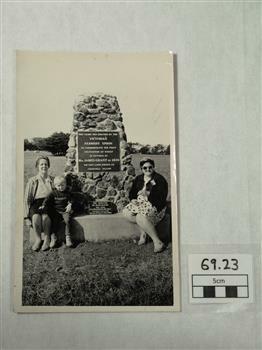 "Typed information on paper strip at bottom of frame this information is also written on back of photograph. '55152 Sapper Thomas John Gange/ ACSC/ Enlisted 10th April 1918 Discharged 17th November 1919"
Brown leather satchell,embossed with Australian flora and forna, front, back and under flap, there is a carry handle on the top. The front features two Kookaburra like birds, under the flap is a Kangaroo and butterfly and folliage on the back. The seams and handle are hand sewn with 2.5mm leather lacing, and there are press studs to hold the flap closed. There are two internal pockets, stitched with fine cotton thread and the stitching is only visable from the inside. This item of meorabilia was made by J.G.Murphy while he was hospitalised in the Middle East during the 2nd World War. 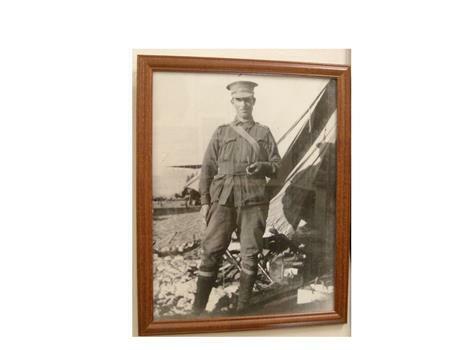 He later became President of the Red Cliffs RSL and a Life Member of the League for service rendered. Aluminium Mess tin set, 2 rectangular tins one smaller to fit into larger. Inscriptions engraved on 4 sides containing locations of training, ships and battle areas. Additional markings include year of manufacture and company along with Department of Defence broad arrow. 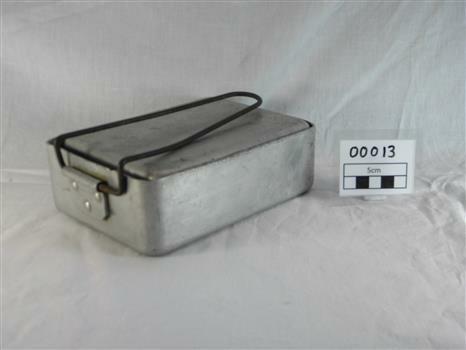 Item is stamped metal with wire handle on the large tin. Wire carry handle missing on smaller tin. 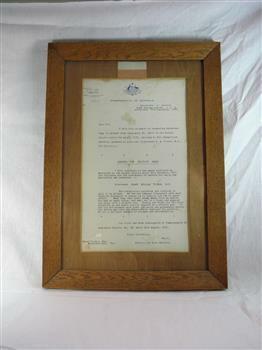 Letter in brown wooden frame with the Battalion colour patch attached to wooden surround under the glass.The letter has the Commonwealth of Australia emblem on the top of the page and was issued by the Department of Defence on the 17th September 1918, to notify Lieutenant F.W. Tickle's father the he had been awarded the Military Cross. It also has the citation for which the Military Cross was awarded. The paper backing on the frame is detiorating. This letter was sent to Mr. Frank Tickle Esquire in Warracknabeal, in Victoria, to inform him that his son Lieutenant Frank William Tickle,M.C. 8th Battaslion, had been awarded the Military Cross. With reference to the award conferred as announced in the London Gazette dated 26th November, 1917. "For conpicuous gallantry and devotion to duty in an attack. He led his company throughout with such fearless disregard of danger as to inspire his men to great effort. When they came under heavy shell fire he halted his men in shell holes, and went out to a flank and engaged the enemy with a machine gun. During the fight for the final objective he was again heavily opposed by a machine gun. He led his men forward with great gallantry and personally killed the entire gun crew and successfully captured the position. He set a splendid example of courage and determination." 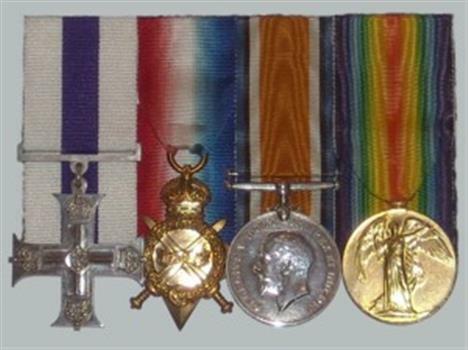 Medals - WW1 Medals awarded to Lieutenant Frank William Tickle M.C. Military Cross has no inscription 1914/15 Star 1087 Pte F.W. Tickle 8 Bn. A.I.F. Victory Medal Lt. F.W. Tickle A.I.F. Enlarged copy of a casual portrait of Lt. Frank William Tickle. It is an outdoor casual photo taken in an encampment. He is in uniform holding a pipe. Background shows tents, guy wires, leather satchell and camp chair. It is in a modern brown wooden frame. The photo is on paper made in Germany. 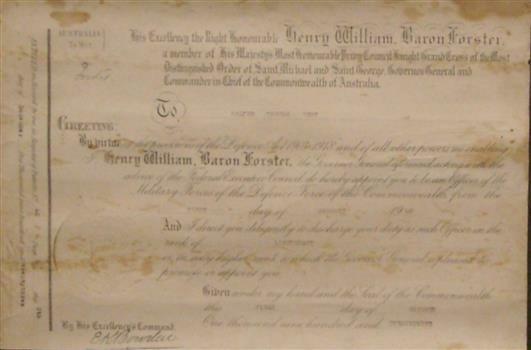 Official Australian Government Certificate.Possibly written in old English script and carries the Royal Seal. This certificate and 5 other documents from the Walter Thomas West Collection, are in a frame 90.40cm x 66.50cm, which has non reflecting glass. Main face of Certificate. "His Excellency the Right Honorable Henry William Baron Forster a member of his Majesty's Most Honorable Privy Council Knight Grand Cross of the most Distinguished Order of Saint Michael and Saint George, Governor General and Commander In Chief of the Commonwealth of Australia. To Walter Thomas West Greeting: By virtue of the provisions of the Defence Act 1903 - 1918 and of all the other powers me enabling I, Henry William Baron Forster, the Goveneror General a foresaid acting with the advice of the Federal Executive Council, do gereby appoint you to be an officer of the Military Forces of the Defence Force of the Commonwealth from the First Day of January 1920. And I direct you diligently to discharge your duty as such officer in the rank of Lieutenant or in any higher rank to which the Governor General is pleased to promote or appoint you. Given under my hand and the seal of the Commonwealth this first day of October One Thousand Nine Hundred and Twenty Three. By the Excellency's Command. (signed) E.K. 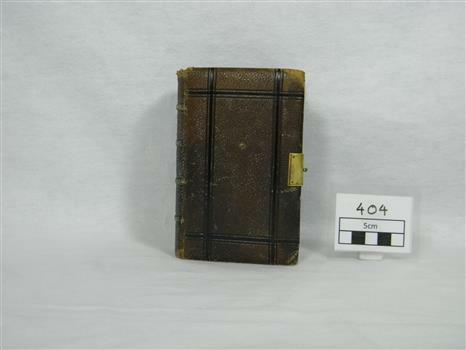 Bowden" Left Hand side Margin: Entered on record by me, in Register of Patents No 40 Page 2 this 5th day of December, One Thousand Nine Hundred and Twenty Three. 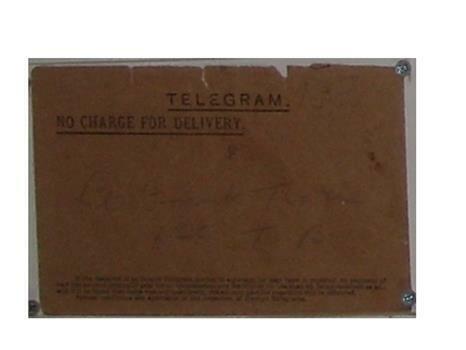 Telegram sent to Lt. Frank William Tickle inviting him to Buckingham Palace from Lord Chamberlain, London.